A pilot, or test, installation of safety and accessibility improvements was implemented on Pershing Drive between Washington Boulevard and North Barton Street in October 2018. The pilot installation includes the addition of pedestrian/streetscape enhancements, protected bike lanes, and bus service efficiencies to improve safety for all roadway users. The pilot is expected to remain in place for several years. Micro-surfacing is complete, and the pavement striping for the section of Pershing Drive between Arlington Boulevard and Washington Boulevard is nearly complete. The recent cool, wet weather has precluded installation of the green shading for the bike lane intersection crossings. This will now be installed in spring 2019. The tree planting adjacent to the new bikeshare station has been installed. The planters at select nubs between Washington Boulevard and North Barton Street will be installed as soon as possible after completion of the pavement striping. Due to the alignment of existing curb ramps, the pilot striping plan for Pershing Drive has change slightly at the North Cleveland Street intersection – one crosswalk instead of two will be installed across Pershing Drive at North Cleveland Street. The beige shading at the painted nubs will not be installed because the County does not have funding to maintain this type of marking long-term. The design for Phase I intersections started in fall 2017. Construction for Phase I intersections is anticipated to begin in late 2019 (see description of phases below). This project seeks to improve safety and accessibility for all users throughout the Barton-Piedmont corridor, within the constraints of a narrow/limited right-of-way. It further seeks to consolidate bus stops to improve bus service efficiency and improve bus stops to better support riders and meet requirements of the Americans with Disabilities Act (ADA). These goals are consistent with the County’s Master Transportation Plan. Pershing Drive is categorized as an urban minor arterial and serves thousands of automobile trips each day. Pershing Drive also supports bus service (ART & WMATA) and many bicyclists and pedestrians. The section of Pershing Drive between North Barton Street and North Piedmont Street has been identified to improve safety and access for all modes of transportation, especially for pedestrians. Pershing Drive is currently marked by many challenging intersections with long crossing distances, non ADA-compliant curb ramps and missing crosswalks. The Pershing Drive right-of-way is variable and very narrow between North Glebe Road and Washington Boulevard, meaning little space is available for accommodating multimodal improvements. Most bus stops on Pershing Drive are also not ADA-compliant. Some stops have been identified as being too closely spaced and failing to meet spacing guidelines recommended by the County’s Bus Stop Design Standards. An analysis of existing conditions along North Pershing Drive began in summer 2015. In early 2016, Transportation staff developed preliminary concept plans for spot improvements along the corridor, referred to collectively as the Pershing Drive Complete Streets project. The concepts were shared with the Lyon Park and Ashton Heights Civic Associations, as well as the Pedestrian and Bicycle Advisory Committees. The intersection supports bus stops that require improvements (North Nelson Street, North Kenmore Street, North Jackson Street, North Garfield Street). The intersection is signalized and in need of upgrading from the very old cable-span signals to the new County-wide standard signals that comply with the ADA and have a longer life cycle. The intersection was previously identified by residents as being problematic for pedestrians, and staff subsequently reviewed it and determined improvements were needed. (North Oakland Street, North Garfield Street, North Danville Street, North Cleveland Street and North Barton Street). Staff received many comments on the preliminary concepts and reviewed them all. This chart summarizes some of the most frequently heard comments and notes staff’s action. The revised scope of the project includes improvements to intersections and continues to implement the Bus Stops Consolidation Plan. Revised concepts were presented at a joint meeting with the Lyon Park and Ashton Heights Civic Associations on May 31, 2017. The revised concepts are indicated in this chart which includes links to revised concept plans. 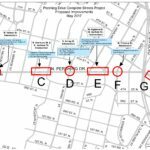 During the planning process, two concepts were generated for improving the section of North Pershing Drive between Washington Boulevard and North Barton Street. The first concept featured a planted median and the second featured protected bike lanes. The comment period for these options ended on June 6, 2018. The feedback submitted was considered by County staff to determine which concept to implement as a pilot installation. Overall feedback generally showed strong support for the protected bicycle lane, Option B. Where possible, staff revised the project design to mitigate concerns about on-street parking and to incorporate additional safety enhancements at the Washington Boulevard intersection. A pilot installation for the protected bicycle lane was implemented in fall 2018. The current project budget cannot support implementation of all improvements at once. Staff recommends implementing the project in phases. Funding for Phase I of this project is provided by the Decal Fee Program, the Virginia Department of Transportation Revenue Sharing Program and the Northern Virginia Transportation Authority. Additional funding for future phases will be sought through the County’s Capital Improvement Plan budgeting process.